Another week of globe-trotting high adventure for Team Arrow; another week season big-bad, Prometheus is nowhere to be found. This time Ollie and the gang (minus Rene who is left behind to be the newly sober Lance’s accountabilabuddy) head to Russia to stop the rogue General Walker from selling a nuke to terrorists. After last week’s hunt for a new Black Canary produced mixed results, “Bratva” at times felt like it had all the excitement of a checklist. The bright spot was Felicity, who after Haven Rock, is determined to keep nukes out of the hands of terrorists, seemingly no matter the cost. The Pandora she received does more than stream music, as it appears to have compromising dirt on everyone. She uses the information to get glammed up and intimidate a Russian mobster. At the end, despite Rory’s warnings about the correlation between great power and great responsibility, Felicity isn’t done using the list to help the team and world – if she’s not getting played by her newfound hacktivist buddy. The rest of the episode played out like a writer accomplishing a list of goals in bullet point fashion. 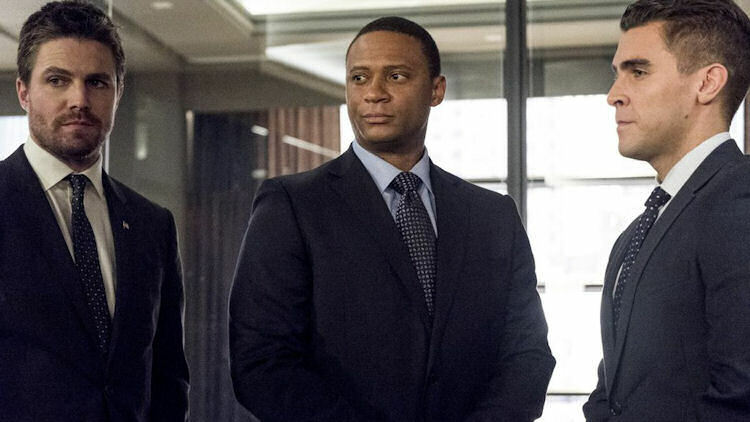 Find the old Diggle: Diggle got his soul back after nearly torturing a captive to death, resisting the urge to kill General Walker after the general made the same kinds of threats to Diggle’s family that triggered Digs to kill his brother. Ditch Rory: The show took care of its “Ragman’s suit is too expensive to CGI every week” problem by having him heroically absorb the blast of the nuclear bomb that Felicity was unable to disarm. His rags have lost their powers and Rory is heading to the sidelines because it’s not stupid. Establish New Canary: That’s ok about Rory, because the New Canary, Dinah is Oliver’s dream of a sidekick: gritty, tough, a sound tactician and really powerful. Bring back Lance: We get Deputy Mayor Captain Lance back from rehab and full of piss and vinegar. While it was good to see him back in the mix again, it seemed like a hollow return since all the action went to Russia the minute he returned. Remember her? : After not seeing her in weeks, Reporter Susan is back to “advise” Ollie, and to try to get into his pants. She successfully seals the latter deal and Ollie nearly spills his secret to her during their pillow talk. Boy, is Ollie going to be mad that his surprise will be ruined because, thanks to her shady private detective, Susan has figured out both Ollie’s Russian gang past, and his secret identity. After a tighter plotted first half of the season, this second half is off to a rocky start with characters dropping in and out (Where’s Thea? What have Prometheus and Evelyn Sharp been doing during their supervillain rumspringa? Is Vigilante ever going to vigilante again?) and plot pieces lugged around like overstuffed boxes. At least the team got to fight in abandoned warehouses in new and interesting places the last couple of weeks, so that’s counts something – right?